BAYELSA - The Oil and Gas Producing Areas Enlightenment and Empowerment Initiative (OGPAEEI), a non-governmental organization, NGO, in Bayelsa state, has said that over 50 fishing settlements have been destroyed by the recent oil spill in Aghoro 1 and 2 communities. Aghoro is hosting an oilfield operated by Shell Petroleum Development Company (SPDC) in Ekeremor Local Government Area of the state. According to sources, the Aghoro 1 and 2 settlements were affected by a spillage from SPDC pipeline network in the area on May 17 this year. Dr Anapunere Awoli, spokesman of the NGO, told our correspondent in Yenagoa on Friday that about 10,000 fishing nets, sources of water and farmland with crops were also adversely impacted and damaged. Awoli, who spoke on behalf of the President of the group, Mr Jackson Igbabiri, said the most affected communities were those in Aghoro 1, including Famous Ama, Garden of Eden, Aya Ama, Azatitor and Birigbene among others. 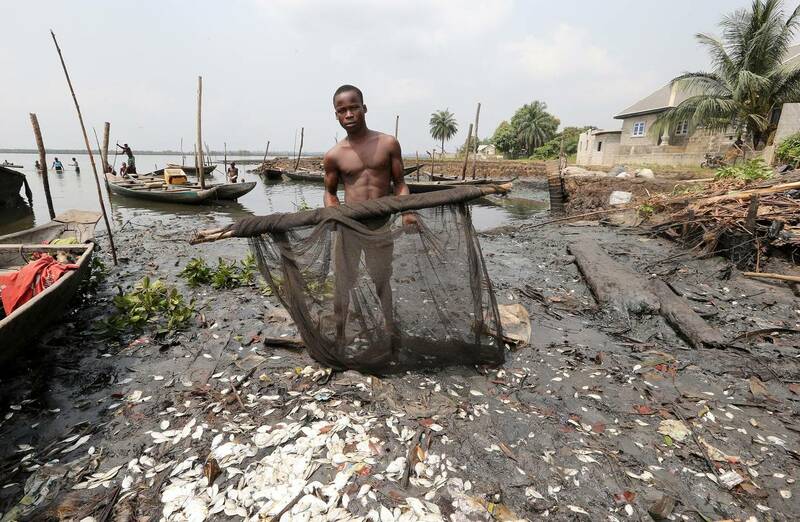 “From the assessment, we conducted on the incident, we found out that about 10,000 fishing nets, over 50 fishing settlements, farmlands including coconut farms, plantain and water yam farms were impacted by the spill. “Some of the fishing settlements in the area are Amasese, Idolo, Semetiegbe, Yoba, Agoloudu, Ama Iyorodtugbene, and Isun Adofeye camp, among others. “We are calling on SPDC to urgently provide alternative sources of water like borehole for the people; the people are also in dire need of medical aid and food items; the situation can lead to public health challenges if not taken care of. “Let me once again commend the state government officials for their visit to the affected communities; it is very encouraging that the state government is sensitive to the plight of the victims; the show of empathy is plausible,” the spokesman said. It could be recalled that the Bayelsa Government, led by the Deputy Governor, Gboribiogha Jonah, had visited the impacted sites and enjoined Shell to apply standard practice to avert a recurrence. In a separate interview, His Majesty, King Enimikem Famous, the traditional ruler of Famous Ama Community in Aghoro, described the incident as “unfortunate” and urged the Federal Government, Shell and other well-meaning Nigerians to come to their aid. Famous expressed dissatisfaction over the suffering of his people due to oil spillages, adding that the adverse effects on human health were worrisome. “We have suffered too much of spills; our people have suffered from several illnesses such as cholera, severe cough and infertility caused by the type of water we consume,” he said.